Adolf Hitler Was Dictator of Nazi Gremany - Nazi Germany World War 2 Section. Adolf Hitler was leader of the Nazi party. 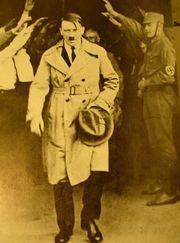 Adolf Hitler gained power in a Germany facing crisis after World War I. Adolf Hitler used charismatic oratory and propaganda, appealing to economic need of the lower and middle classes, nationalism and anti-Semitism to establish an authoritarian regime. Adolf Hitler restructured the economy and rearmed the military. Adolf Hitler was Chancellor of Germany from 1933, and Führer (Leader) of Germany from 1934, until his death. 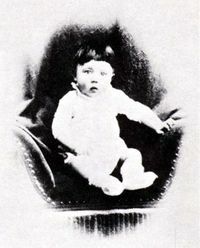 Adolf Hitler was leader of the National Socialist German Workers Party..
A photo of Adolf Hitler as an infant. Adolf Hitler pursued an aggressive foreign policy with the intention of expanding German Lebensraum ("living space") and triggered World War II in Europe by ordering the invasion of Poland. At the height of its power, Nazi Germany occupied most of Europe, but it and the Axis Powers were eventually defeated by the Allies. By then, Adolf Hitler's racial policies had culminated in the genocide of 11 million people, including about six million Jews, in what is now known as the Holocaust. In the final days of the war, Hitler committed suicide in his underground bunker in Berlin with his newlywed wife, Eva Braun. Adolf Hitler the Early Years. Adolf Hitler was born on April 20, 1889, around 6:30 PM LMT, at Braunau am Inn, Austria, a small town in Upper Austria, on the border with Germany. He was the third son and the fourth of six children of Alois Hitler (born Schicklgruber) (1837-1903), a minor customs official, and Klara Pölzl (1860-1907), his second cousin, and third wife. Alois was born illegitimate and for the first thirty-nine years of his life bore his mother's name, Schicklgruber. The name Hitler appears in the maternal and paternal line. Both Hitler's grandmother on his mother's side and his grandfather on his father's side were named Hitler, or rather variants of it, for the family name was variously written as Hiedler, Huetler, Huettler and Hitler. Because of Adolf's mother, an episcopal dispensation had to be obtained for the marriage. Of Alois and Klara's six children, only Adolf and his younger sister Paula reached adulthood. 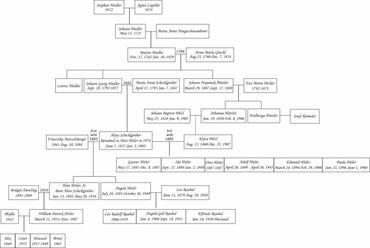 Alois Hitler also had a son (Alois Junior) and a daughter (Angela) by his second wife. In 1876, Alois began using the name of his stepfather, Johann Georg Hiedler, after visiting a priest responsible for birth registries and declaring that Georg was his father (Alois gave the impression that Georg was still alive but he was long dead). The spelling was probably changed to "Hitler" by a clerk. Later, Adolf Hitler was accused by his political enemies of not rightfully being a Hitler, but a Schicklgruber. This was also exploited in Allied propaganda during the Second World War when pamphlets bearing the phrase "Heil Schicklgruber" were airdropped over German cities. Adolf was legally born a Hitler, however, and was also closely related to Hiedler through his maternal grandmother, Johanna Hiedler. Adolf Hitler was not sure who his paternal grandfather was, but it was probably either Johann Georg Hiedler or his brother Johann Nepomuk Hiedler. There have been rumours that Hitler was one-quarter Jewish and that his paternal grandmother, Maria Schicklgruber, had become pregnant after working as a servant in a Jewish household in Graz. During the 1920s, the implications of these rumours along with his known family history were politically explosive, especially for the proponent of a racist ideology. Opponents tried to prove that Hitler, the leader of the anti-Semitic Nazi Germany Party, had Jewish or Czech ancestors. Although these rumours were never confirmed, for Hitler they were reason enough to conceal his origins. Soviet propaganda insisted Hitler was a Jew, though more modern research tends to diminish the probability that he had Jewish ancestors. According to Robert G. L. Waite in The Psychopathic God: Adolf Hitler, Hitler made it illegal for German women to work in Jewish households, and after the Anschluss with Austria, Hitler had his father's hometown obliterated as an artillery practice area. Hitler seemed to fear that he was Jewish, and as Waite points out, this fact is more important than whether he actually was. Because of Alois Hitler's profession, his family moved frequently, from Braunau to Passau, Lambach, Leonding, and Linz. As a young child, Hitler was reportedly a good student at the various elementary schools he attended; however, in sixth grade (1900-1), his first year of high school (Realschule) in Linz, he failed completely and had to repeat the grade. His teachers reported that he had "no desire to work." Adolf Hitler later explained this educational slump as a kind of rebellion against his father Alois, who wanted the boy to follow him in a career as a customs official, although Adolf wanted to become a painter. This explanation is further supported by Hitler's later description of himself as a misunderstood artist. However, after Alois died on January 3, 1903, when Adolf was 13, Hitler's schoolwork did not improve. At the age of 16, Hitler left school with no qualifications. Adolf Hitler early adulthood in Vienna and Munich. 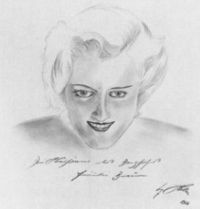 Sketch of Eva Braun by Hitler. "The purpose of my trip was to study the picture gallery in the Court Museum, but I had eyes for scarcely anything but the Museum itself. From morning until late at night, I ran from one object of interest to another, but it was always the buildings which held my primary interest." (Mein Kampf, Chapter II, paragraph 3). "In a few days I myself knew that I should some day become an architect. To be sure, it was an incredibly hard road; for the studies I had neglected out of spite at the Realschule were sorely needed. One could not attend the Academy's architectural school without having attended the building school at the Technic, and the latter required a high-school degree. I had none of all this. The fulfillment of my artistic dream seemed physically impossible. "(Mein Kampf, Chapter II, paragraph 5 & 6). 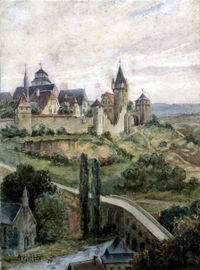 A watercolour by Adolf Hitler depicting Laon, France. On December 21, 1907, his mother Klara died a painful death from breast cancer at the age of 47. Adolf Hitler gave his share of the orphans' benefits to his younger sister Paula, but when he was 21 he inherited some money from an aunt. He worked as a struggling painter in Vienna, copying scenes from postcards and selling his paintings to merchants and tourists (there is evidence he produced over 2000 paintings and drawings before World War I). After the second refusal from the Academy of Arts, Adolf Hitler gradually ran out of money. By 1909, he sought refuge in a homeless shelter, and by the beginning of 1910 had settled permanently into a house for poor working men. He earned spending money by painting tourist postcards of Vienna scenery. Several biographers have noted that a Jewish resident of the house named Hanisch helped him sell his postcards. "There were very few Jews in Linz. In the course of centuries the Jews who lived there had become Europeanized in external appearance and were so much like other human beings that I even looked upon them as Germans. The reason why I did not then perceive the absurdity of such an illusion was that the only external mark which I recognized as distinguishing them from us was the practice of their strange religion. As I thought that they were persecuted on account of their faith my aversion to hearing remarks against them grew almost into a feeling of abhorrence. I did not in the least suspect that there could be such a thing as a systematic anti-Semitism. Adolf Hitler began to claim the Jews were natural enemies of what he called the Aryan race. He held them responsible for Austria's crisis. He also identified certain forms of Socialism and especially Bolshevism, which had many Jews among its leaders, as Jewish movements, merging his anti-Semitism with anti-Marxism. Blaming Germany's military defeat on the 1917 Revolutions, he considered Jews the culprit of Imperial Germany's military defeat and subsequent economic problems as well. Adolf Hitler's obsession with the Jews sometimes verged on the ridiculous. He blamed personal misfortunes on the Jews and especially on rabbis. Landscape painted by Adolf Hitler. Generalising from tumultuous scenes in the parliament of the multi-national Austria Monarchy, he developed a firm belief in the inferiority of the democratic parliamentary system, which formed the basis of his political views. However, according to August Kubizek, his close friend and roommate at the time, he was more interested in the operas of Richard Wagner than in politics. Adolf Hitler received a small inheritance from his father in May 1913 and moved to Munich. He later wrote in Mein Kampf that he had always longed to live in a "real" German city. In Munich, he became more interested in architecture and the writings of Houston Stewart Chamberlain. Moving to Munich also helped him escape military service in Austria for a time, but the Austrian army later arrested him. After a physical exam (during which his height was measured at 173 cm, or 5 ft 8 in) and a contrite plea, he was deemed unfit for service and allowed to return to Munich. However, when Germany entered World War I in August 1914, he immediately petitioned King Ludwig III of Bavaria for permission to serve in a Bavarian regiment, this request was granted, and Adolf Hitler enlisted in the Bavarian army. Adolf Hitler World War 1. Hitler saw active service in France and Belgium as a messenger for the regimental headquarters of the 16th Bavarian Reserve Regiment (also called Regiment List after its first commander), which exposed him to enemy fire. Unlike his fellow soldiers, Hitler reportedly never complained about the food or hard conditions, preferring to talk about art or history. He also drew some cartoons and instructional drawings for the army newspaper. His behaviour as a soldier was considered somewhat sloppy, but his regular duties required taking dispatches to and from fighting areas and he was twice decorated for his performance of these duties. He received the Iron Cross, Second Class in December 1914 and the Iron Cross, First Class in August 1918, an honour rarely given to a Gefreiter. However, because of the perception of "a lack of leadership skills" on the part of some of the regimental staff, as well as (according to Kershaw) Hitler's unwillingness to leave regimental headquarters (which would have been likely in event of promotion), he was never promoted to Unteroffizier. Other historians, however, say that the reason he was not promoted is that he did not have German citizenship. His duty station at regimental headquarters, while often dangerous, gave Adolf Hitler time to pursue his artwork. During October 1916 in northern France, Hitler was wounded in the leg, but returned to the front in March 1917. He received the Wound Badge later that year, as his injury was the direct result of hostile fire. Sebastian Haffner, referring to Hitler's experience at the front, suggests he did have at least some understanding of the military. It is also believed that during the Battle of Fromelles, when the Australian troops charged the bunkers, a group of around 15 Diggers were only metres from the bunker in which the young Adolf Hitler was within. Some say that had the machinegunners in the bunker reloaded some 5-10 seconds later, they would've been able to take the bunker, and no doubt capture or kill Adolf Hitler. On October 15, 1918, shortly before the end of the war, Hitler was admitted to a field hospital, temporarily blinded by a poison gas attack. Research by Bernhard Horstmann indicates the blindness may have been the result of a hysterical reaction to Germany's defeat. Hitler later said it was during this experience that he became convinced the purpose of his life was to "save Germany". Meanwhile he was treated by a military physician and specialist in psychiatry, who reportedly diagnosed the corporal as "incompetent to command people" and "dangerously psychotic". Some scholars, including Lucy Dawidowicz, argue that an intention to mass murder Europe's Jews was fully formed in Adolf Hitler's mind, though he probably hadn't thought through how it could be done. At the beginning of the Great War, or even during the War, if twelve or fifteen thousand of these Jews who were corrupting the nation had been forced to submit to poison-gas . . . then the millions of sacrifices made at the front would not have been in vain. (Volume 2, Chapter 15 "The Right to Self-Defence"). These tactics are based on an accurate estimation of human weakness and must lead to success, with almost mathematical certainty, unless the other side also learns how to fight poison gas with poison gas. The weaker natures must be told that here it is a case of to be or not to be. (Volume 1, Chapter 2 "Years of Study and Suffering in Vienna") Hitler had long admired Germany, and during the war he had become a passionate German patriot, although he did not become a German citizen until 1932 (the year before he took over Germany). He was shocked by Germany's capitulation in November 1918 even while the German army still held enemy territory. Like many other German nationalists, Hitler believed in the Dolchstoßlegende ("dagger-stab legend") which claimed that the army, "undefeated in the field," had been "stabbed in the back" by civilian leaders and Marxists back on the home front. These politicians were later dubbed the November Criminals. The Treaty of Versailles deprived Germany of various territories, demilitarized the Rhineland and imposed other economically damaging sanctions. The treaty also declared Germany the culprit for all the horrors of the Great War, as a basis for later imposing not yet specified reparations on Germany (the amount was repeatedly revised under the Dawes Plan, Young Plan and the Hoover Moratorium). Germans, however, perceived the treaty and especially the paragraph on the German guilt as a humiliation, not least as it was damaging in the extreme to their pride. For example, there was nearly a full demilitarisation of the armed forces, allowing Germany only 6 battleships, no submarines, no air force, an army of 100,000 without conscription and no armoured vehicles. The treaty was an important factor in both the social and political conditions encountered by Hitler and his National Socialist Party as they sought power. Hitler and his party used the signing of the treaty by the "November Criminals" as a reason to build up Germany so that it could never happen again. He also used the 'November Criminals' as scapegoats, although at the Paris peace conference, these politicians had very little choice in the matter. Adolf Hitler early years of the Nazi Germany Party. A copy of Adolf Hitler's forged DAP membership card. His actual membership number was 555 (the 55th member of the party - the 500 was added to make the group appear larger) but later the number was reduced to create the impression that Hitler was one of the founding members (Ian Kershaw Hubris). Hitler had wanted to create his own party, but was ordered by his superiors in the Reichswehr to infiltrate an existing one instead. After the First World War, Hitler remained in the army, which was mainly engaged in suppressing communist uprisings breaking out across Germany, including Munich (the Bavarian Soviet Republic), where Adolf Hitler returned in 1919. He took part in "national thinking" courses organized by the Education and Propaganda Department (Dept Ib/P) of the Bavarian Reichswehr Group, Headquarters 4 under Captain Mayr. A key purpose of this group was to create a scapegoat for the outbreak of the war and Germany's defeat. The scapegoats were found in "international Jewry", communists, and politicians across the party spectrum, especially the parties of the Weimar Coalition, who were deemed "November Criminals". In July 1919, Hitler was appointed a Verbindungsmann (police spy) of an Aufklärungskommando (Intelligence Commando) of the Reichswehr, for the purpose of influencing other soldiers toward similar ideas and was assigned to infiltrate a small party, the German Workers' Party (DAP), which was thought of to be a possibly socialist party. During his inspection of the party, Hitler was impressed with Drexler's anti-Semitic, nationalist and anti-Marxist ideas, which favoured an Hegelian concept of the strong universally present state, a "non-Jewish" version of socialism and mutual solidarity of all members of society. Here Hitler also met Dietrich Eckart, one of the early founders of the party and member of the occult Thule Society. Eckart became Hitler's mentor, exchanging ideas with him, teaching him how to dress and speak, and introducing him to a wide range of people. Hitler in return thanked Eckart by paying tribute to him in the second volume of Mein Kampf. Adolf Hitler was discharged from the army in March 1920 and with his former superiors' continued encouragement began participating full time in the party's activities. By early 1921, Adolf Hitler was becoming highly effective at speaking in front of even larger crowds. In February, Hitler spoke before a crowd of nearly six thousand in Munich. To publicize the meeting, he sent out two truckloads of Party supporters to drive around with swastikas, cause a commotion and throw out leaflets, their first use of this tactic. Hitler gained notoriety outside of the Party for his rowdy, polemic speeches against the Treaty of Versailles, rival politicians (including monarchists, nationalists and other non-internationalist socialists) and especially against Marxists and Jews. The German Workers' Party was centered in Munich which had become a hotbed of German nationalists who included Army officers determined to crush Marxism and undermine or even overthrow the young German democracy centred in Berlin. Gradually they noticed Adolf Hitler and his growing movement as a vehicle to hitch themselves to. Hitler traveled to Berlin to visit nationalist groups during the summer of 1921 and in his absence there was an unexpected revolt among the DAP leadership in Munich. The Party was run by an executive committee whose original members considered Hitler to be overbearing and even dictatorial. To weaken Hitler's position they formed an alliance with a group of socialists from Augsburg. Hitler rushed back to Munich and countered them by tendering his resignation from the Party on July 11, 1921. When they realized the loss of Hitler would effectively mean the end of the Party, he seized the moment and announced he would return on the condition that he was made chairman and given dictatorial powers. Infuriated committee members (including founder Anton Drexler) held out at first. 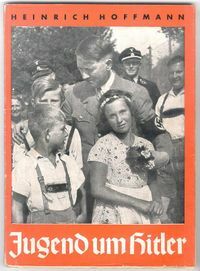 Meanwhile an anonymous pamphlet appeared entitled Adolf Hitler: Is he a traitor?, attacking Hitler's lust for power and criticizing the violence-prone men around him. Hitler responded to its publication in a Munich newspaper by suing for libel and later won a small settlement. The executive committee of the DAP eventually backed down and Hitler's demands were put to a vote of party members. Hitler received 543 votes for and only one against. At the next gathering on July 29, 1921, Adolf Hitler was introduced as Führer of the National Socialist Party, marking the first time this title was publicly used. Hitler changed the name of the party to the National Socialist German Workers Party (Nationalsozialistische Deutsche Arbeiterpartei or NSDAP). Adolf Hitler's beer hall oratory, attacking Jews, social democrats, liberals, reactionary monarchists, capitalists and communists, began attracting adherents. Early followers included Rudolf Hess, the former air force pilot Hermann Göring, and the flamboyant army captain Ernst Röhm, who became head of the Nazis' paramilitary organization, the SA, which protected meetings and attacked political opponents. He also attracted the attention of local business interests, was accepted into influential circles of Munich society and became associated with wartime General Erich Ludendorff during this time. Adolf Hitler The Beer Hall Putsch. Encouraged by this early support, Hitler decided to use Ludendorff as a front in an attempt to seize power later known as the Beer Hall Putsch (and sometimes as the Hitler Putsch or Munich Putsch). The Nazi Germany Party had copied the Italian Fascists in appearance and also had adopted some programmatical points and now, in the turbulent year 1923, Hitler wanted to emulate Mussolini's "March on Rome" by staging his own "Campaign in Berlin". 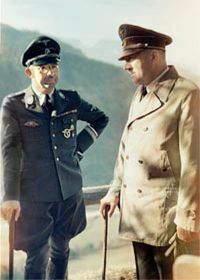 Hitler and Ludendorff obtained the clandestine support of Gustav von Kahr, Bavaria's de facto ruler along with leading figures in the Reichswehr and the police. As political posters show, Ludendorff, Hitler and the heads of the Bavarian police and military planned on forming a new government. However on November 8, 1923 Kahr and the military withdrew their support during a meeting in the Bürgerbräukeller, a large beer hall outside of Munich. A surprised Hitler had them arrested and proceeded with the coup. Unknown to him, Kahr and the other detainees had been released on Ludendorff's orders after he obtained their word not to interfere. That night they prepared resistance measures against the coup and in the morning, when Hitler and his followers marched from the beer hall to the Bavarian War Ministry to overthrow the Bavarian government as a start to their "March on Berlin," the army quickly dispersed them (Ludendorff was wounded and a few other Nazis were killed). Adolf Hitler fled to the home of friends and contemplated suicide. He was soon arrested for high treason and appointed Alfred Rosenberg as temporary leader of the party but found himself in an environment somewhat receptive to his beliefs. During Hitler's trial, sympathetic magistrates allowed Hitler to turn his debacle into a propaganda stunt. He was given almost unlimited amounts of time to present his arguments to the court along with a large body of the German people, and his popularity soared when he voiced basic nationalistic sentiments shared by the public. On April 1, 1924 Hitler was sentenced to five years' imprisonment at Landsberg prison for the crime of conspiracy to commit treason. Hitler received favoured treatment from the guards and had much fan mail from admirers. While at Landsberg he dictated his political book Mein Kampf (My Struggle) to his deputy Rudolf Hess. The book, dedicated to Thule Society member Dietrich Eckart, was both an autobiography and an exposition of his political ideology. It was published in two volumes in 1925 and 1926 respectively, but did not sell very well until Hitler came to power (though by the late 1930s nearly every household in Germany had a copy of it). Meanwhile, as he was considered relatively harmless, Hitler was released on December 20, 1924. Adolf Hitler rebuilding of the party. At the time of Hitler's release, the political situation in Germany had calmed down, and the economy had improved, which hampered Hitler's opportunities for agitation. Instead, he began a long effort to rebuild the dwindling party. Though the Hitler Putsch had given Hitler some national prominence, his party's mainstay was still Munich. To spread the party to the north, Hitler also assimilated independent groups, such as the Nuremberg-based Wistrich, led by Julius Streicher, who now became Gauleiter of Franconia. As Hitler was still banned from public speeches, he appointed Gregor Strasser, who in 1924 had been elected to the Reichstag, as Reichsorganisationsleiter, authorizing him to organise the party in northern Germany. Gregor, joined by his younger brother Otto and Joseph Goebbels, steered an increasingly independent course, emphasizing the socialist element in the party's programme. The Arbeitsgemeinschaft der Gauleiter Nord-West became an internal opposition, threatening Hitler's authority, but this faction was defeated at the Bamberg Conference (1926), during which Goebbels joined Hitler. After this encounter, Adolf Hitler centralized the party even more and asserted the Führerprinzip as the basic principle of party organization. Leaders were not elected by their group but were rather appointed by their superior and were answerable to them while demanding unquestioning obedience from their inferiors. Consistent with Hitler's disdain for democracy, all power and authority devolved from the top down. A key element of Hitler's appeal was his ability to convey a sense of offended national pride caused by the Treaty of Versailles imposed on the defeated German Empire by the Entente. Germany had lost economically important territory in Europe along with its colonies and in admitting to sole responsibility for the war had agreed to pay a huge reparations bill totaling 32 billion mark. Most Germans bitterly resented these terms but early Nazi Germany attempts to gain support by blaming these humiliations on "international Jewry" were not particularly successful with the electorate. The party learned quickly and soon a more subtle propaganda emerged, combining anti-Semitism with an attack on the failures of the "Weimar system" and the parties supporting it. Having failed in overthrowing the Republic by a coup, Hitler now pursued the "strategy of legality": this meant formally adhering to the rules of the Weimar Republic until he had legally gained power and then to transform liberal democracy into an authoritarian dictatorship. Some party members, especially in the paramilitary SA, opposed this strategy and Ernst Röhm ridiculed Hitler as "Adolphe Legalité". Adolf Hitler The Brüning administration. Hitler emerges from the Brown House in Munich (headquarters of the Nazi Germany party during the last days of the Weimar Republic) after a post-election meeting in 1930. The political turning point for Adolf Hitler came when the Great Depression hit Germany in 1930. The Weimar Republic had never been firmly rooted and was openly opposed by right-wing conservatives (including monarchists), Communists and the Nazis. As the parties loyal to the democratic, parliamentary republic found themselves unable to agree on counter-measures, their Grand Coalition broke up and was replaced by a minority cabinet. The new Chancellor Heinrich Brüning of the Roman Catholic Centre Party, lacking a majority in parliament, had to implement his measures through the President's emergency decrees. Tolerated by the majority of parties, the exception soon became the rule and paved the way for authoritarian forms of government. The Reichstag's initial opposition to Brüning's measures led to premature elections in September 1930. The republican parties lost their majority and their ability to resume the Grand Coalition, while the Nazis suddenly rose from relative obscurity to win 18.3% of the vote along with 107 seats in the Reichstag, becoming the second largest party in Germany. Adolf Hitler emerges from the Brown House in Munich (headquarters of the Nazi Germany party during the last days of the Weimar Republic) after a post-election meeting in 1930. Brüning's measure of budget consolidation and financial austerity brought little economic improvement and was extremely unpopular. Under these circumstances, Hitler appealed to the bulk of German farmers, war veterans and the middle-class who had been hard-hit by both the inflation of the 1920s and the unemployment of the Depression. Hitler received little response from the urban working classes and traditionally Catholic regions. Hitler over Germany. Political campaign by airplane. Meanwhile on September 18, 1931 Hitler's niece Geli Raubal was found dead in her bedroom in his Munich apartment (his half-sister Angela and her daughter Geli had been with him in Munich since 1929), an apparent suicide. Geli was 19 years younger than he was and had used his gun, drawing rumours of a relationship between the two. The event is viewed as having caused lasting turmoil for him. In 1932 Adolf Hitler intended to run against the aging President Paul von Hindenburg in the scheduled presidential elections. Though Hitler had left Austria in 1913, he still had not acquired German citizenship and hence could not run for public office. In February however, the state government of Brunswick, in which the Nazi Germany Party participated, appointed Hitler to some minor administrative post and also gave him citizenship. The new German citizen ran against Hindenburg, who was supported by a broad range of reactionary nationalist, monarchist, Catholic, Republican and even social democratic parties, and against the Communist presidential candidate. His campaign was called "Hitler über Deutschland" (Hitler over Germany). The name had a double meaning. Adolf Hitler over Germany. Political campaign by airplane. Besides an obvious reference to Hitler's dictatorial intentions, it also referred to the fact that Hitler was campaigning by airplane. This was a brand new political tactic that allowed Adolf Hitler to speak in two cities in one day, which was practically unheard of at the time. Hitler came in second on both rounds, attaining more than 35% of the vote during the second one in April. Although he lost to Hindenburg, the election established Hitler as a realistic and fresh alternative in German politics. Adolf Hitler: The cabinets of Papen and Schleicher. President Hindenburg, influenced by the Camarilla, became increasingly estranged from Brüning and pushed his Chancellor to move the government in a decidedly authoritarian and right-wing direction. This culminated in May 1932 with the resignation of the Brüning cabinet. Hindenburg appointed the nobleman Franz von Papen as chancellor, heading a "cabinet of barons". Papen was bent on authoritarian rule and since in the Reichstag only the conservative DNVP supported his administration, he immediately called for new elections in July. In these elections, the Nazis achieved their biggest success yet and won 230 seats. The Nazis had become the largest party in the Reichstag without which no stable government could be formed. Papen tried to convince Hitler to become Vice-Chancellor and enter a new government with a parliamentary basis. Hitler however rejected this offer and put further pressure on Papen by entertaining parallel negotiations with the Centre Party, Papen's former party, which was bent on bringing down the renegade Papen. In both negotiations Hitler demanded that he, as leader of the strongest party, must be Chancellor, but President Hindenburg consistently refused to appoint the "Bohemian private" to the Chancellorship. After a vote of no-confidence in the Papen government, supported by 84% of the deputies, the new Reichstag was dissolved and new elections were called in November. This time, the Nazis lost some votes but still remained the largest party in the Reichstag. After Papen failed to secure a majority he proposed to dissolve the parliament again along with an indefinite postponement of elections. Hindenburg at first accepted this, but after General Kurt von Schleicher and the military withdrew their support, Hindenburg instead dismissed Papen and appointed Schleicher, who promised he could secure a majority government by negotiations with both the Social Democrats, the trade unions, and dissidents from the Nazi Germany party under Gregor Strasser. In January 1933 however, Schleicher had to admit failure in these efforts and asked Hindenburg for emergency powers along with the same postponement of elections that he had opposed earlier, to which the President reacted by dismissing Schleicher. Meanwhile Papen, resentful because of his dismissal, tried to get his revenge on Schleicher by working toward the General's downfall, through forming an intrigue with the camarilla and Alfred Hugenberg, media mogul and chairman of the DNVP. Also involved were Hjalmar Schacht, Fritz Thyssen and other leading German businessmen. They financially supported the Nazi Germany Party, which had been brought to the brink of bankruptcy by the cost of heavy campaigning. The businessmen also wrote letters to Hindenburg, urging him to appoint Hitler as leader of a government "independent from parliamentary parties" which could turn into a movement that would "enrapture millions of people." Finally, the President reluctantly agreed to appoint Hitler Chancellor of a coalition government formed by the NSDAP and DNVP. Hitler and two other Nazi Germany ministers (Frick, Göring) were to be contained by a framework of conservative cabinet ministers, most notably by Papen as Vice-Chancellor and by Hugenberg as Minister of Economics. 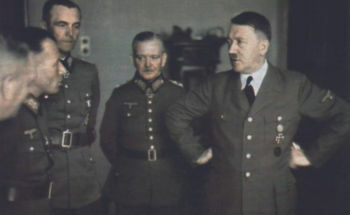 Papen wanted to use Hitler as a figure-head, but the Nazis had gained key positions, most notably the Ministry of the Interior. On the morning of January 30, 1933, in Hindenburg's office, Adolf Hitler was sworn in as Chancellor during what some observers later described as a brief and simple ceremony. Adolf Hitler: Reichstag Fire and the March elections. Having become Chancellor, Hitler foiled all attempts to gain a majority in parliament and on that basis convinced President Hindenburg to dissolve the Reichstag again. Elections were scheduled for early March, but on February 27, 1933, the Reichstag building was set on fire. Since a Dutch independent communist was found in the building, the fire was blamed on a Communist plot to which the government reacted with the Reichstag Fire Decree of February 28, which suspended basic rights, including habeas corpus. Under the provisions of this decree, the Communist Party and other groups were suppressed, and Communist functionaries and deputies were arrested, put to flight, or murdered. Campaigning continued, with the Nazis making use of paramilitary violence, anti-Communist hysteria, and the government's resources for propaganda. On election day, March 6, the NSDAP increased its result to 43.9% of the vote, remaining the largest party, but its victory was marred by its failure to secure an absolute majority. Hitler had to maintain his coalition with the DNVP, as the coalition had a slim majority. On 21 March, the new Reichstag was constituted itself with an impressive opening ceremony held at Potsdam's garrison church. This "Day of Potsdam" was staged to demonstrate reconciliation and union between the revolutionary Nazi Germany movement and "Old Prussia" with its elites and virtues. 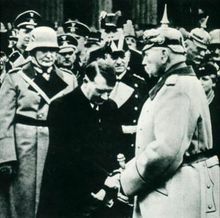 Hitler himself appeared not in Nazi Germany uniform but in a tail coat, and humbly greeted the aged President Hindenburg. Because of the Nazis' failure to obtain a majority on their own, Hitler's government confronted the newly elected Reichstag with the Enabling Act that would have vested the cabinet with legislative powers for a period of four years. Though such a bill was not unprecedented, this act was different since it allowed for deviations from the constitution. As the bill required a two-thirds majority in order to pass, the government needed the support of other parties. The position of the Catholic Centre Party, at this point the third largest party in the Reichstag, turned out to be decisive: under the leadership of Ludwig Kaas, the party decided to vote for the Enabling Act. It did so in return for the government's oral guarantees regarding the Church's liberty, the concordats signed by German states and the continued existence of the Centre Party itself. On 23 March, the Reichstag assembled in a replacement building under extremely turbulent circumstances. Some SA men served as guards within while large groups outside the building shouted slogans and threats toward the arriving deputies. Kaas announced that the Centre would support the bill amid "concerns put aside. ", while Social Democrat Otto Wels denounced the Act in his speech. At the end of the day, all parties except the Social Democrats voted in favour of the bill. The Enabling Act was dutifully renewed every four years, even through World War II. With this combination of legislative and executive power, Hitler's government further suppressed the remaining political opposition. The KPD and the SPD were banned, while all other political parties dissolved themselves. Labour unions were merged with employers' federations into an organisation under Nazi Germany control and the autonomy of state governments was abolished. Adolf Hitler in Triumph of the Will. Adolf Hitler also used the SA paramilitary to push Hugenberg into resigning and proceeded to politically isolate Vice Chancellor Papen. As the SA's demands for political and military power caused much anxiety among the populace in general and especially among the military, Hitler used allegations of a plot by the SA leader Ernst Röhm to purge the paramilitary force's leadership during the Night of the Long Knives. Opponents unconnected with the SA were also murdered, notably Gregor Strasser and former Chancellor Kurt von Schleicher. Soon after, president Paul von Hindenburg died on 2 August 1934. Rather than holding new presidential elections, Hitler's cabinet passed a law proclaiming the presidency dormant and transferred the role and powers of the head of state to Hitler as Führer und Reichskanzler (leader and chancellor). Thereby Hitler also became supreme commander of the military, which swore their military oath not to the state or the constitution but to Hitler personally. In a mid-August plebiscite these acts found the approval of 90% of the electorate. Combining the highest offices in state, military and party in his hand, Hitler had attained supreme rule that could no longer be legally challenged. Adolf Hitler And The Third Reich. Pictures like the one on the cover of Heinrich Hoffmann's book of photography were used to promote Hitler's populist-nationalist (Völkisch) image. Having secured supreme political power, Hitler went on to gain their support by persuading most Germans he was their saviour from the Depression, the Communists, the Versailles Treaty, and the Jews along with other "undesirable" minorities. Adolf Hitler economics and culture. 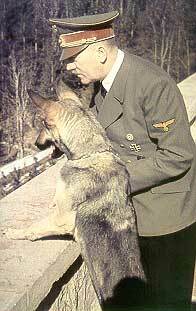 Popular photo theme were Hitler and his dog Blondi, here seen at the terrace of the Berghof. Adolf Hitler oversaw one of the greatest expansions of industrial production and civil improvement Germany had ever seen, mostly based on debt flotation and expansion of the military. Nazi Germany policies toward women strongly encouraged them to stay at home to bear children and keep house. In a September 1934 speech to the National Socialist Women's Organization, Adolf Hitler argued that for the German woman her "world is her husband, her family, her children, and her home," a policy which was reinforced by the bestowing of the Cross of Honor of the German Mother on women bearing four or more babies. The unemployment rate was cut substantially, mostly through arms production and sending women home so that men could take their jobs. Given this, claims that the German economy achieved near full employment are at least partly artifacts of propaganda from the era. Much of the financing for Hitler's reconstruction and rearmament came from currency manipulation by Hjalmar Schacht, including the clouded credits through the Mefo bills. The negative effects of this inflation were offset in later years by the acquisition of foreign gold from the treasuries of conquered nations. Hitler also oversaw one of the largest infrastructure improvement campaigns in German history, with the construction of dozens of dams, autobahns, railroads and other civil works. Hitler's policies emphasised the importance of family life: men were the "breadwinners", while women's priorities were to lie in bringing up children and in household work. This revitalising of industry and infrastructure came at the expense of the overall standard of living, at least for those not affected by the chronic unemployment of the later Weimar Republic, since wages were slightly reduced in pre-war years despite a 25% increase in the cost of living (Shirer 1959). Hitler's government sponsored architecture on an immense scale, with Albert Speer becoming famous as the first architect of the Reich. While important as an Architect in implementing Hitler's classicist reinterpretation of German culture, Speer would prove much more effective as armaments minister during the last years of WWII. In 1936 Berlin hosted the summer Olympic games, which were opened by Hitler and choreographed to demonstrate Aryan superiority over all other races, achieved mixed results. Olympia, the movie about the games and documentary propaganda films for the German Nazi Germany Party were directed by Hitler's personal filmmaker Leni Riefenstahl. Although Hitler made plans for a Breitspurbahn (broad gauge railroad network), they were pre-empted by World War II. Had the railroad been built, its gauge would have been three metres, even wider than the old Great Western Railway of Britain. Hitler contributed to the design of the car that later became the Volkswagen Beetle, and charged Ferdinand Porsche with its construction. The Gestapo-SS complex (the SS and Gestapo organizations) were primarily responsible for repression in the Nazi Germany state. This was implemented not only against political enemies such as communists but also against perceived "asocials" such as habitual criminals and the work-shy along with "racial enemies," mainly Jews. The racial policies of Nazi Germany during the early to mid-1930s included the harassment and persecution of Jews through legislation, restrictions on their civil rights, and the imposition of limits on their economic opportunities. Under the 1935 Nuremberg Laws Jews lost their German citizenship and were expelled from government employment, their professions, and most forms of economic activity. To indicate their Jewishness, Jews were forced to adopt a second name and had their papers stamped with a big red "J". The policy was successful in causing the emigration of many thousands but nevertheless turned increasingly violent in the mid to late 1930s. In 1938 a pogrom orchestrated by Joseph Goebbels and endorsed by Hitler called Kristallnacht destroyed many Jewish businesses and synagogues and resulted in about 100 deaths. Between November 1938 and September 1939 more than 180,000 Jews fled Germany and the Nazis seized whatever property they had left behind. From 1941 Jews were required to wear a yellow star of David in public. Throughout the 1930s, the Propaganda Ministry disseminated anti-Semitic propaganda. Adolf Hitler: Rearmament and new alliances. 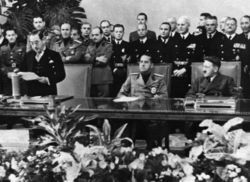 Axis Powers signing with Saburo Kurusu (Japan's Ambassador to Germany), Galeazzo Ciano (Italy's Foreign Minister) and Adolf Hitler. Axis Powers signing with Saburo Kurusu (Japan's Ambassador to Germany), Galeazzo Ciano (Italy's Foreign Minister) and Adolf Hitler. In March 1935 Hitler repudiated the Treaty of Versailles by reintroducing conscription in Germany. He set about building a massive military machine, including a new Navy (the Kriegsmarine) and an Air Force (the Luftwaffe). The enlistment of vast numbers of men and women in the new military seemed to solve unemployment problems but seriously distorted the economy. For the first time in a generation, Germany's armed forces were as strong as those of her neighbour, France. In March 1936 Adolf Hitler again violated the Treaty of Versailles by reoccupying the demilitarized zone in the Rhineland. When Britain and France did nothing, he grew bolder. In July 1936 the Spanish Civil War began when the military, led by General Francisco Franco, rebelled against the elected Popular Front government of Spain. Hitler sent troops to support Franco and Spain served as a testing ground for Germany's new armed forces and their methods, including the bombing of undefended towns such as Guernica, which was destroyed by the Luftwaffe in April 1937, prompting Pablo Picasso's famous eponymous painting. An Axis was declared between Germany and Italy by Galeazzo Ciano, foreign minister of Fascist dictator Benito Mussolini on October 25, 1936. Tripartite Treaty was then signed by Saburo Kurusu of Imperial Japan, Adolf Hitler of Nazi Germany and Galeazzo Ciano of Fascist Italy in September 27, 1940 and was later expanded to include Hungary, Romania and Bulgaria. They were collectively known as the Axis Powers. Then on November 5, 1937, at the Reich Chancellory, Adolf Hitler held a secret meeting and stated his plans for acquiring "living space" (Lebensraum) for the German people. Adolf Hitler with Heinrich Himmler, chief of the SS. Between 1939 and 1945 the SS, assisted by collaborationist governments and recruits from occupied countries, systematically killed about 11 million people, including about 6 million Jews, in concentration camps, ghettos and mass executions, or through less systematic methods elsewhere. Besides being gassed to death, many also died of starvation and disease while working as slave labourers (sometimes benefiting private companies in the process, because of the low cost of such labour). Along with Jews, non-Jewish Poles (over 3 million of whom died), alleged communists or political opposition, members of resistance groups, resisting Roman Catholics and Protestants, homosexuals, Roma, the physically handicapped and mentally retarded, Soviet prisoners of war, Jehovah's Witnesses, anti-Nazi clergy, trade unionists, and psychiatric patients were killed. This industrial-scale genocide in Europe is referred to as the Holocaust (the term is also used by some authors in a narrower sense, to refer specifically to the unprecedented destruction of European Jewry in particular). The massacres that led to the coining of the word "genocide" (the Endlösung der jüdischen Frage or "Final Solution of the Jewish Question") were planned and ordered by leading Nazis, with Himmler playing a key role. While no specific order from Hitler authorizing the mass killing of the Jews has surfaced, there is documentation showing that he approved the Einsatzgruppen and the evidence also suggests that sometime in the fall of 1941 Himmler and Hitler agreed in principle on mass extermination by gassing. During interrogations by Soviet intelligence officers declassified over fifty years later, Hitler's valet Heinz Linge and his military aide Otto Gunsche said Hitler had "pored over the first blueprints of gas chambers." To make for smoother intra-governmental cooperation in the implementation of this "Final Solution" to the "Jewish question", the Wannsee conference was held near Berlin on January 20, 1942, with fifteen senior officials participating, led by Reinhard Heydrich and Adolf Eichmann. The records of this meeting provide the clearest evidence of central planning for the Holocaust. Days later, on February 22, Hitler was recorded saying to his closest associates, "we shall regain our health only by eliminating the Jew". Adolf Hitler World War 2. Hitler with Romanian leader Ion Antonescu (far left). 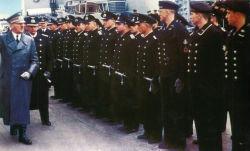 Hitler inspecting units of the Kriegsmarine. On March 12, 1938, Hitler pressured his native Austria into unification with Germany (the Anschluss) and made a triumphal entry into Vienna. Next, he intensified a crisis over the German-speaking Sudetenland districts of Czechoslovakia. This led to the Munich Agreement of September 1938, which authorized the annexation and immediate military occupation of these districts by Germany. As a result of the summit, Hitler was time magazine's Man of the Year in 1938. British prime minister Neville Chamberlain hailed this agreement as "Peace in our time", but by giving way to Hitler's military demands Britain and France also left Czechoslovakia to Hitler's mercy. Adolf Hitler ordered Germany's army to enter Prague on March 10, 1939 and from Prague Castle proclaimed Bohemia and Moravia a German protectorate. After that, Hitler was claiming territories ceded to Poland under the Versailles Treaty. Britain had not been able to reach an agreement with the Soviet Union for an alliance against Germany, and, on August 23, 1939, Hitler concluded a secret non-aggression pact (the Molotov-Ribbentrop Pact) with Stalin on which it was likely agreed that the Soviet Union and Nazi Germany would partition Poland. On September 1, Germany invaded the western portion of Poland. Britain and France, who had guaranteed assistance to Poland, declared war on Germany. Not long after this, on September 17, Soviet forces invaded eastern Poland. After capturing western Poland by the end of September, Hitler built up his forces much further during the so-called Phony War. In April 1940, he ordered German forces to march into Denmark and Norway. In May 1940, Hitler ordered his forces to attack France, conquering the Netherlands, Luxembourg and Belgium in the process. France surrendered on June 22, 1940. This series of victories convinced his main ally, Benito Mussolini of Italy, to join the war on Hitler's side in May 1940. Britain, whose defeated forces had evacuated France from the coastal town of Dunkirk, continued to fight alongside Canadian forces in the Battle of the Atlantic. After having his overtures for peace systematically rejected by the defiant British Government, now led by Winston Churchill, Hitler ordered bombing raids on the British Isles, leading to the Battle of Britain, a prelude of the planned German invasion. The attacks began by pounding the RAF airbases and the radar stations protecting South-East England. However, the Luftwaffe failed to defeat the RAF by the end of October 1940. Air superiority for the invasion, code-named Operation Sealion, could not be assured and Hitler ordered bombing raids to be carried out on British cities, including London and Coventry, mostly at night. Adolf Hitler the path to defeat. Adolf Hitler inspecting German submarines together with Hungarian admiral Horthy. On June 22, 1941, Hitler gave the signal for three million German troops to attack the Soviet Union, breaking the non-aggression pact he had concluded with Stalin less than two years earlier. This invasion, code-named Operation Barbarossa, seized huge amounts of territory, including the Baltic states, Belarus, and Ukraine, along with the encirclement and destruction of many Soviet forces. German forces, however, were stopped short of Moscow in December 1941 by the Russian winter and fierce Soviet resistance, and the invasion failed to achieve the quick triumph over the Soviet Union which Hitler had anticipated. Hitler discussing the war strategy with Erwin Rommel (left, facing Hitler) amidst other German Field Marshals. In May 1942 Reinhard Heydrich, one of the highest SS officers and one of Hitler's favorite subordinates, was assassinated by British-trained Czech operatives in Prague. Hitler reacted by ordering brutal reprisals, including the massacre of Lidice. In late 1942, German forces under Feldmarschall Erwin Rommel were defeated in the second battle of El Alamein, thwarting Hitler's plans to seize the Suez Canal and the Middle East. In February of 1943, the lengthy Battle of Stalingrad ended with the complete encirclement and destruction of the German 6th Army. Both defeats were turning points in the war, although the latter is more commonly considered primary. From this point on, the quality of Hitler's military judgment became increasingly erratic and Germany's military and economic position deteriorated. Hitler's health was deteriorating too. His left hand started shaking uncontrollably. The biographer Ian Kershaw believes he suffered from Parkinson's disease. Other conditions that are suspected by some to have caused some (at least) of his symptoms are methamphetamine addiction and syphilis. Adolf Hitler's ally Benito Mussolini was overthrown in 1943 after Operation Husky, an American and British invasion of Sicily. Throughout 1943 and 1944, the Soviet Union steadily forced Hitler's armies into retreat along the eastern front. On June 6, 1944 the Western allied armies landed in northern France in what was the largest amphibious operation ever conducted, Operation Overlord. Realists in the German army knew defeat was inevitable and some officers plotted to remove Hitler from power. In July 1944 one of them, Claus von Stauffenberg, planted a bomb at Hitler's military headquarters in Rastenburg (the so-called July 20 Plot), but Hitler narrowly escaped death. He ordered savage reprisals, resulting in the executions of more than 4,900 people (sometimes by starvation in solitary confinement followed by slow strangulation). The main resistance movement was destroyed although smaller isolated groups such as Die Rote Kapelle continued to operate. 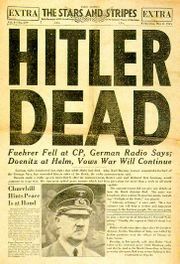 Adolf Hitler defeat and death. Cover of US newspaper The stars and Stripes, May 1945. In April 1945 Soviet forces were at the gates of Berlin. Hitler's closest lieutenants urged him to flee to Bavaria or Austria to make a last stand in the mountains, but he seemed determined to either live or die in the capital. 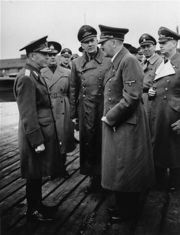 SS leader Heinrich Himmler tried on his own to inform the Allies (through the Swedish diplomat Count Folke Bernadotte) that Germany was prepared to discuss surrender terms. Meanwhile Hermann Göring sent a telegram from Bavaria in which he argued that since Hitler was cut off in Berlin, as Hitler's designated successor he should assume leadership of Germany. Hitler angrily reacted by dismissing both Himmler and Göring from all their offices and the party and declared them traitors. After intense street-to-street combat, when Soviet troops were spotted within a block or two of the Reich Chancellory in the city centre, Hitler committed suicide in the Führerbunker on April 30, 1945 by means of a self-delivered shot to the head (it is likely he simultaneously bit into a cyanide ampoule). Hitler's body and that of Eva Braun (his long-term mistress whom he had married the day before) were put in a bomb crater, partially burned with gasoline by Führerbunker aides and hastily buried in the Chancellory garden as Russian shells poured down and Red Army infantry continued to advance only two or three hundred metres away. He also killed his dog Blondi around the same time. When Russian forces reached the Chancellory they found his body and an autopsy was performed using dental records (and German dental assistants who were familiar with them) to confirm the identification. To avoid any possibility of creating a potential shrine the remains of Hitler and Braun were repeatedly moved, then secretly buried by SMERSH at their new headquarters in Magdeburg. In April 1970, when the facility was about to be turned over to the East German government, the remains were reportedly exhumed, thoroughly cremated, and the ashes finally dumped unceremoniously into the Elbe. According to the Russian Federal Security Service, a fragment of human skull stored in its archives and displayed to the public in a 2000 exhibition came from the remains of Hitler's body uncovered by the Red Army in Berlin, and is all that remains of Hitler; however, the authenticity of the skull has been challenged by many historians and researchers. At the time of Hitler's death most of Germany's infrastructure and major cities were in ruins and he had left explicit orders to complete the destruction. Millions of Germans were dead with millions more wounded or homeless. In his will he dismissed other Nazi Germany leaders and appointed Grand Admiral Karl Dönitz as Reichspräsident (President of Germany) and Goebbels as Reichskanzler (Chancellor of Germany). However, Goebbels and his wife Magda committed suicide on 1 May 1945. On 8 May 1945, in Reims, France, the German armed forces surrendered unconditionally ending the war in Europe and with the creation of the Allied Control Council on 5 June 1945, the Four Powers assumed "supreme authority with respect to Germany." Adolf Hitler's proclaimed Thousand Year Reich had lasted 12 years. Since the defeat of Germany in World War II, Hitler, the Nazi Germany Party and the results of Nazism have been regarded in most of the world as synonymous with evil. Historical and cultural portrayals of Hitler in the west are, by virtually universal consensus, condemnatory. The copyright of Hitler's book Mein Kampf in Europe is claimed by the Free State of Bavaria and will expire in 2015. Reproductions in Germany are generally authorized only for scholarly purposes and in heavily commented form. The situation is however unclear; Werner Maser (whom Theodor Heuss proposed to publish "Mein Kampf" as a weapon against Nazi Germany Ideology) comments that intellectual property cannot be confiscated and so, it still would lie in the hands of Hitler's nephew, who, however, does not want to have anything to do with Hitler's legacy. This situation leads to contested trials eg. in Poland and Sweden. In the USA, "Mein Kampf" is still published, as well as in other countries like Turkey or Israel, from publishers with various political positions. The display of swastikas or other Nazi Germany symbols is prohibited in Germany and political extremists are generally under surveillance by the Verfassungsschutz, one of the federal or state-based offices for the protection of the constitution. There have been instances of public figures referring to his legacy in neutral or favourable terms, particularly in South America, the Islamic World and parts of Asia. Future Egyptian President Anwar Sadat wrote favourably of Hitler in 1953. Bal Thackeray, leader of the right-wing Shiv Sena party in the Indian state of the Maharashtra, declared in 1995 that he was an admirer of Hitler. 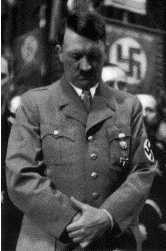 Hitler in a prayer-like position. Adolf Hitler was brought up in his family's religion by his Roman Catholic parents. According to historian Bradley F. Smith, Hitler's father, though nominally a Catholic, was a freethinker, while his mother was a practicing Catholic. According to historian Michael Rissmann young Adolf was influenced in school by Pan-Germanism and Darwinism and began to reject the Church and Catholicism, receiving Confirmation only unwillingly. A boyhood friend reports that after Hitler had left home, he never attended mass or received the Sacraments. 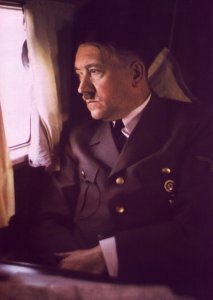 Hitler's religious beliefs can be gathered from his public and private statements; they present a discrepant picture and some attributed private statements remain disputed. In public statements, especially before 1938, Hitler frequently spoke positively about the Christian heritage of German culture and belief in Christ. In doing so, he used his "ability to simulate, even to potentially critical Church leaders, an image of a leader keen to uphold and protect Christianity", according to Ian Kershaw. For example, on March 23, 1933, he addressed the Reichstag: "The National Government regards the two Christian confessions (i.e. Catholicism and Protestantism) as factors essential to the soul of the German people. ... We hold the spiritual forces of Christianity to be indispensable elements in the moral uplift of the German people." At one point he described his religious status: "I am now as before a Catholic and will always remain so." Hitler never ended his church membership, but according to Albert Speer, "he had no real attachment to it." Adolf Hitler’s private statements are more mixed. There are negative statements about Christianity reported by Hitler’s intimates, Goebbels, Speer, and Bormann. Joseph Goebbels, for example, notes in a diary entry in 1939: "The Führer is deeply religious, but deeply anti-Christian. He regards Christianity as a symptom of decay." Albert Speer reports a similar statement: "You see, it’s been our misfortune to have the wrong religion. Why didn’t we have the religion of the Japanese, who regard sacrifice for the Fatherland as the highest good? The Mohammedan religion too would have been much more compatible to us than Christianity. Why did it have to be Christianity with its meekness and flabbiness?" In the Hossbach Memorandum Hitler is recorded as saying that "only the disintegrating effect of Christianity, and the symptoms of age" were responsible for the demise of the Roman empire. In contrast to other Nazi Germany leaders, Hitler did not adhere to esoteric ideas, occultism, or neo-paganism, and possibly even ridiculed such beliefs in private. Drawing on Higher Criticism and some branches of theologically liberal Protestantism, Hitler advocated what he termed Positive Christianity, purged of everything that he found objectionable in conventional Christianity. Hitler never directed his attacks on Jesus Himself, but viewed traditional Christianity as a corruption of the original ideas of Jesus, whom Hitler regarded as an Aryan opponent of the Jews. In Mein Kampf he wrote that Jesus "made no secret of his attitude toward the Jewish people, and when necessary he even took the whip to drive from the temple of the Lord this adversary of all humanity, who then as always saw in religion nothing but an instrument for his business existence. In return, Christ was nailed to the cross." Hitler rejected the idea of Jesus' redemptive suffering, stating in 1927: "My feeling as a Christian points me to my Lord and Savior as a fighter. It points me to the man who once in loneliness, surrounded by a few followers, recognized these Jews for what they were and summoned men to fight against them and who, God's truth! was greatest not as a sufferer but as a fighter." "What we must fight for is to safeguard the existence and the reproduction of our race ... so that our people may mature for the fulfillment of the mission alloted it by the creator of the universe. ... Peoples that bastardize themselves, or let themselves be bastardized, sin against the will of eternal Providence." The Jews he viewed as enemies of all civilisation and as materialistic, unspiritual beings, writing in Mein Kampf: "His life is only of this world, and his spirit is inwardly as alien to true Christianity as his nature two thousand years previous was to the great founder of the new doctrine." In his rhetoric Hitler also fed on the old accusation of Jewish Deicide. 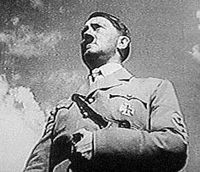 Hitler described his supposedly divine mandate for his anti-Semitism: "Hence today I believe that I am acting in accordance with the will of the Almighty Creator: by defending myself against the Jew, I am fighting for the work of the Lord." As Protestantism was more open to such reinterpretations and some branches had similar views, Hitler demonstrated a preference for Protestantism over Catholicism. His views were supported by the German Christians movement, but rejected by the Confessing Church. According to Steigmann-Gall, Hitler regretted that "the churches had failed to back him and his movement as he had hoped;" and he stated according to Albert Speer: "Through me the Protestant Church could become the established church, as in England." From childhood, Hitler admired the pomp of Catholic ritual and the hierarchical organisation of the clergy. In Mein Kampf he argued that the "dogmatic system" of the Catholic church could be a model for the Nazis. Later, he drew on these elements, organizing his party along hierarchical lines and including liturgical forms into events or using phraseology taken from hymns. Because of these liturgical elements, Hitler's Messiah-like status and the ideology's all-encompassing nature, the Nazi Germany movement is sometimes termed a "political religion". Hitler himself, however, strongly rejected the idea that Nazism was in any way a religion. It has been argued that Christian anti-Semitism influenced Hitler's ideas, especially such works as Martin Luther's essay On the Jews and Their Lies and the writings of Paul de Lagarde. However in Mein Kampf Hitler writes of an upbringing in which no particular anti-Semitic prejudice prevailed. In Linz Hitler wrote of no apparent anti-Semitism either in his family unit nor being expressed by the Catholic Church of his childhood. Hitler's own ambivalence about Christianity is evident in a passage in which he simultaneously laments the destruction of Paganism, but at the same time says Christianity's way to state power could be a useful model for the "New Age", for Nazism. "The individual may establish with pain today that with the appearance of Christianity the first spiritual terror entered into the far freer ancient world, but he will not be able to contest the fact that since then the world has been afflicted and dominated by this coercion, and that coercion is broken only by coercion, and terror by terror. Only then can a new state of affairs be constructively created." 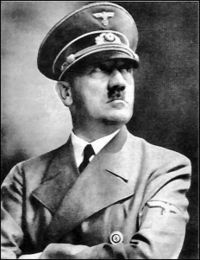 Hitler's alleged health problems in his later years have long been the subject of debate, and he has variously been suggested to have suffered from irritable bowel syndrome, skin lesions, irregular heartbeat, tremors on the left side of his body, syphilis, Parkinson's disease and a strongly suggested addiction to methamphetamines. The most prominent, and longest-living direct descendants of Adolf Hitler's father, Alois, was his nephew William Patrick Hitler. With his wife Phyllis, he eventually moved to Long Island, New York and had four sons. None of William Hitler's children have yet had any children of their own. Over the years various investigative reporters have attempted to track down other distant relatives of the Führer; many are now alleged to be living inconspicuous lives and have long since changed their last name. Vol 1: Ch 1. Vol 1: Ch 2. Vol 1: Ch 2 Con 1. Vol 1: Ch 2 Con 2. Vol 1: Ch 2 Con 3. Vol 1: Ch 2 Con 4. Vol 1: Ch 2 Con 5. Vol 1: Ch 2 Con 6. Vol 1: Ch 3. Vol 1: Ch 3 Con 1. Vol 1: Ch 3 Con 2. Vol 1: Ch 3 Con 3. Vol 1: Ch 3 Con 4. Vol 1: Ch 3 Con 5. Vol 1: Ch 3 Con 6. Vol 1: Ch 3 Con 7. Vol 1: Ch 3 Con 8. Vol 1: Ch 4. Vol 1: Ch 4 Con 1 Vol 1: Ch 4 Con 2. Vol 1: Ch 4 Con 3. Vol 1: Ch 5. Vol 1: Ch 6. Vol 1: Ch 7 Vol 1: Ch 8. Vol 1: Ch 9. Vol 1: Ch 10 Vol 1: Ch 11. Vol 1: Ch 12. Vol 2: Ch 1. Vol 2: Ch 2. Vol 2: Ch 3. Vol 2: Ch 4. Vol 2: Ch 5. Vol 2: Ch 6. Vol 2: Ch 7. Vol 2: Ch 8. Vol 2: Ch 9. Vol 2: Ch 10. Vol 2: Ch 11. Vol 2: Ch 12. Vol 2: Ch 13.